It is not uncommon to pick up a newspaper and read a headline regarding the Middle East. It doesn’t matter if you are in Algiers or Amman; the Middle East is certainly changing. There are certain countries in the Middle East — Lebanon, Syria, Egypt, Jordan, Iraq and the Palestinian Territories — that seem to be in the news more than their neighbors are. The reason these countries are so newsworthy is that they all have watershed events, processes and decisions that have taken hold of them. Most people are tempted to lump them all together in saying “the region is changing,” which it is. However, when each country is examined individually one realizes they have internal situations that separate them from the region. For the first time (in a long time), the name “Assad” does not reign over Beirut. Recently, Syria withdrew its military forces from Lebanon for the first time in 29 years. It has not been a quiet withdrawal. The withdrawal was prompted when former Prime Minister Rafiq Hariri of Lebanon was killed by a car bomb. Following his death a wave of nationalism, protests and anger swept over the country. This wave caught the attention of the international community immediately; as a result, international pressure on Syria snowballed dramatically. Eventually, with no other options Syria completely withdrew its forces from the country. This is a historic event; Lebanon will finally have the chance to return to autonomy and perhaps restore itself to what it used to be prior to the civil war (1960's). Before the Lebanese can celebrate, however, a few issues must be addressed. Assessment — The stability of Lebanon is not certain. 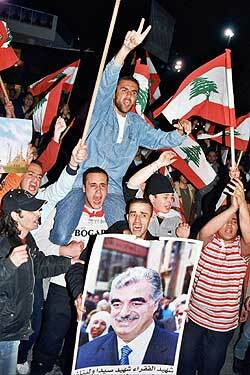 There was a 15-year civil war in Lebanon, and under the Taif accords (1989), the war ended. Since the accords, Syria's iron hand kept the country somewhat stable. Now, the hand is gone and questions are arising regarding a resurgence of conflict. There are a few questions; the first is religious conflict, will it begin again? The Christian populations are not happy with the results of the elections that took place in June and are claiming foul play. Second, Hezbollah, the armed political party, will be pressed to disarm, which could be difficult to accomplish. Finally, many people forget that President Emile Lahoud, who recently re-elected, was Syria's choice, which means Syrian influence could remain. Only time will tell Lebanon’s future, but one thing is clear: the Lebanese people have many obstacles to overcome before they can begin to celebrate. Syria’s future does not look bright. Not only have they been pressured out of Lebanon by the international community (it only took 29 years and an assassination to do it), but they also have been fingered in the Hariri assassination: “It is the commission’s conclusion that … many leads point directly towards Syrian security officials as being involved with the assassination.” Basher al-Assad is now feeling the pressure, the United Nations, the United States and Europe are on his back, there is a war on his border and he must make something happen … soon. It won’t be easy for Assad, who never planned to be president, his brother Basil was groomed for the presidential seat but died suddenly and Assad found himself the heir to his father’s office. Hafez al-Assad (his father) enjoyed the respect of the Alawites in Syria and his regional neighbors looked at him as a strong-willed unwavering man. His son is seen in a different vein, internal opposition is at an all time high, international opposition is even higher and even regional neighbors try to avoid Syria as much as possible. Assessment — Assad is not as strong politically as his father was, it will be difficult for him to get out of this situation without having sanctions imposed on Syria, not to mention the loss of all credibility with his Arab neighbors. He has two choices: succumb to U.N. and largely U.S. requests or fight tooth and nail against them. Either way, he will be alienating someone. If he goes the first route, he will alienate the hard liners in Syria and cause more internal dissention. If he goes the second route, he will alienate most of his regional neighbors (if he has not done so already) and naturally the U.S. and the U.N., which could lead to sanctions. It’s all in Assad's hands — the question is how will he play this one? It is almost as if someone is pressing the fast-forward button in Egypt. Everyday there are new headlines making the world press. The most obvious: for the first time during Mubarak’s 24-year presidency, he has been legally contested. The last election represents the first time he has had to run against another candidate … ever. The U.S. rejoiced at the event, claiming it was a step toward democracy; it was — sort of. Let’s make sure we know that Mubarak won close to 90 percent of the vote. Mubarak had two main opponents — Ayman Nour and Noman Gomaa — who cried that the election was tampered with. Most likely they are right, it is difficult to recall the last politician anywhere who won close to 90 percent of an election. In addition, let’s not forget the masses of protestors and critics who were beaten or killed in the voting process. Has Egypt progressed or regressed from its recent elections? Assessment — It is hard to say that Egypt has regressed politically despite the violence and flawed outcome. It will be very difficult for Egypt to return to its “yes” or “no” referendum style voting, and free speech is a little more accepted in the country. The biggest issue now facing the administration is the Muslim Brotherhood. Although they are not a legal political party, they are probably the most supported group in the country, which means they are the biggest threat to the administration. The administration has done everything they can to destroy the Brotherhood’s support, but it has only grown. Recently in ZagaZig, a small town near the Delta, police killed eight people as they tried to vote for the Brotherhood in parliamentary elections. If Egypt has a chance to create a real democracy, it cannot suppress political groups or votes, especially with violence. This will only cause more violence and opposition. The administration needs to solve the Brotherhood issue, because the group is not going anywhere anytime soon. The most recent large-scale terrorist attack (outside of Iraq) took place in Amman, Jordan, on Nov. 9 when three international hotels were the target of suicide bombers. Jordan was one of the few countries considered safe and terrorist-free despite the madness occurring on their borders. King Abdullah took the attack very personally because he knew it was a huge blow to Jordan. Before the latest bombing, Jordan's future was bright, most of the international services that had operated in Iraq, moved to Amman, creating jobs, increasing real estate sales and injecting money into the economy. The US has relied heavily on Jordan for security services and information. In addition, due to its tiny and relatively content population, many of the problems that plague Middle Eastern countries (civil unrest, unemployment and radical militants) are not as overbearing in Jordan. However, what does this latest attack mean? Let’s hope it does not mean that the violence in Iraq has spilled over into Jordan; if so, Jordan’s future could change rapidly. Assessment — The international community’s confidence in Jordan seems to be unshaken by the latest terrorist attacks, which is both good and bad. This is good, because they will not be quick to pull operations out of Jordan; it is bad, because it may make Jordan a more likely target for terrorist attacks. King Abdullah, however, will fight the militants as hard he can. And because there is a strong sense of nationalism in Jordan, a “rally around the king effect” will only help his fight. Stable, happy, peaceful and safe are not words used to describe Iraq nowadays. The situation in Iraq has deteriorated and will continue to deteriorate until an effective Iraqi army and security service can come into play. The U.S. and British forces are trying their best, but it will be very difficult to defeat a guerilla insurgency. Even politically, there is trouble; although the referendum for the constitution has passed, it passed with controversy. Sunnis for the most part do not support the draft constitution. As far as developing the country, it is very difficult for N.G.O.s, development agencies and other organizations to work in such chaotic conditions. They are the main entities for re-building Iraq, employing Iraqis and spurring favorable economic conditions. If they cannot do their job, who will? Assessment — The U.S. Army is wearing thin, and there is growing pressure on the U.S. home front. It looks like there will be a very strong push to get Iraqi security trained and ready to battle the insurgency, but it may take years. There is a very long and tough road ahead to win Iraq. The Palestinian Territories has always been the hotbed of the Middle East. Two of the most significant events in recent years have taken place within the last twelve months. The first event was the death of Yasir Arafat, the controversial yet recognized Palestinian leader; the second, the withdrawal of Israeli settlements from the Gaza strip. Both are watershed events. Arafat, shaped Palestinian opinion and foreign policy for decades, some may say for the better and some may say for the worse. Regardless, now the Palestinian people have the chance to re-shape and re-think their opinion and policies, which is definitely needed. Mahmoud Abbas, the new leader of Palestine, has had a rocky road but has been effective as he oversaw the withdrawal of Gaza. The withdrawal of the Gaza strip is ground breaking because it is the first time Israel has handed over any major piece of land to the Palestinians. However, before it is claimed as a victory, one must realize that Israeli cooperation is necessary for the strip actually to become a livable area. For Gaza to develop economically Israel must allow the re-opening of the airport, the seaport and the Rafah crossing. Recently, Israel did come to an agreement on the Rafah crossing, allowing European inspectors to monitor the crossing. However, a lot more is needed to provide a livable Gaza Strip for the 1.4 million mostly impoverished Palestinians. Assessment — The Palestinians dream of statehood via a two-state solution with Israel. They are on the right road with a new Gaza, which looks like they might have a chance to make a livable area. With Israeli cooperation, Gaza can develop economically, but the whole situation hangs on the thread of stopping violence. If the Palestinian Authority can stop terrorist attacks, Israel will have no other option but to cooperate. With cooperation, the Gaza strip can develop and both sides can move along the road map to peace. If they cannot stop attacks, they face a very grim situation and potential chaos in Gaza with militants having more control than the P.A. Therefore, Abbas needs to do everything in his power to get the Palestinian people on his side and strengthen his security force so the Palestinian people will have a bright future. Mounir Ibrahim has lived in the Middle East and has extensively studied the region. He currently lives and works in Washington, D.C.
View the Worldpress Desk’s profile for Mounir Ibrahim.